This website is written by Joel R. Brandes. Skype to: joelrbrandes. Advisor and counsel to the legal profession in matrimonial, custody and international child abduction litigation, and trials and appeals. By appointment only. New York Divorce and Family Law™ is the definitive site on the web for New York Divorce and Family Law. The best way to navigate this extensive website is to click on the menu in the upper left hand corner to view its contents or click here for the site map. A search box is in the upper right hand corner. The 2019 Child Support Standards Chart was released on March 1, 2019. The 2019 poverty income guidelines amount for a single person as reported by the United States Department of Health and Human Services is $12,490 and the 2019 self-support reserve is $16,862. The combined parental income amount remains at $148,000. See https://www.childsupport.ny.gov/dcse/pdfs/CSSA.pdf (last accessed March 1, 2019). By Administrative Order 72/19, Revised Forms for Use in Matrimonial Actions in Supreme Court were adopted effective March 1, 2019. The revisions reflect the increases as of March 1, 2019 in the Self Support Reserve to $16,861.50 and in the Poverty Income Level for a single person to $12,490 (See https://www.childsupport.ny.gov/dcse/child_support_standards.html). ​ Joel R. Brandes, of the New York Bar, is the author of The New York Matrimonial Trial Handbook (published by Joel R. Brandes Consulting Services, Inc.) It is available in Bookstores and online in the print edition at the Bookbaby Bookstore, Amazon , Barnes & Noble, Goodreads and other online book sellers. It is available on this website in a Kindle ebook edition and in an epub ebook edition (for most other ebook readers). ​ The New York Matrimonial Trial Handbook was reviewed in the New York Law Journal. Click here to read the review. 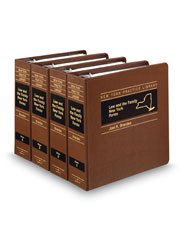 Law and The Family New York, 2d (New York Practice Library, 9 Volumes) By Joel R. Brandes. (Updated October 2018) . ​Description. This set provides you with practitioner-tested forms for a wide variety of family law matters. It includes forms relating to the creation of the marriage relationship, the attorney-client relationship, matrimonial agreements, and matrimonial litigation. Specific topics covered include antenuptial agreements, separation agreements, modification agreements, and matters relating to infants and incompetents, and service of process. ​ The information on this site pertains to New York law and is offered as a public service. It is not intended to give legal advice about a specific legal problem. Due to the importance of the individual facts of every case, the information on this site may not necessarily be applicable to any particular case. Changes in the law could at any time make parts of this web site obsolete. The information on this web site was not necessarily written by persons licensed to practice law in a particular jurisdiction. The publisher is not engaged in rendering legal advice and this publication is not intended to give legal advice about a specific legal problem, nor is it a substitute for the advice of an attorney. This information is provided with the understanding that if legal advice is required the services of a competent attorney should be sought. New York, NY 10036-7424. 212-859-5079. New York Divorce and Family Law™ is published by Joel R. Brandes Consulting Services, Inc., a Florida Corporation, located at 2881 NE 33rd Court, Fort Lauderdale, Florida 33306. Telephone 954-564-9883. Send email to divorce@ix.netcom.com. Copyright © 2019, Joel R. Brandes Consulting Services, Inc. All rights reserved. ​​ Joel R. Brandes Consulting Services, Inc. is a creative writing and publishing company. We provide expert matrimonial and family law content for client newsletters, law firm websites and attorney or law firm blogs. We also assist lawyers with drafting articles for legal journals and preparing presentations and materials for lectures and seminars. The definitive site on the web for New York Divorce and Family Law.